Gigrin camp site is about half a mile south of the town of Rhayader, near to the river Wye, and enjoys pleasant views over the surrounding hills. 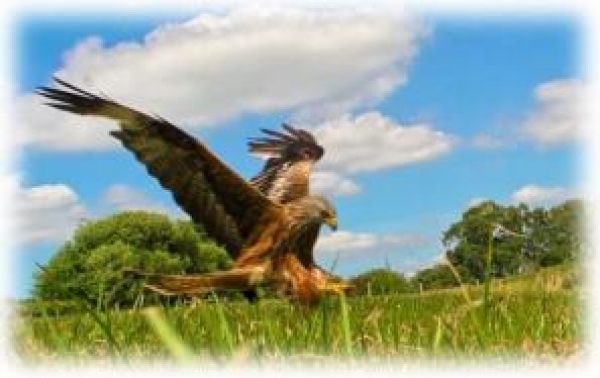 Red Kite Feeding has been taking place at Gigrin Farm for 365 days a year the past 18 years without break. Feeding times change as red kites don't know that the clocks change twice a year. ...Feeding is at 2pm from the Sunday of the last weekend in October, and throughout the winter until March..
We open from 1pm every day but for Christmas Day. Booking is only required if you are coming as a group (12 or more) or organising a coach party. Click Here for disabled Access. It should be noted, by those who need to drive down the 130 mtrs to the hides from the carpark, that it is necassery to arrive at the farm no later that 2pm in summer in order to secure a parking space and place(s) in a hide. Or, telephone us beforehand on 01597 810 243. Dogs are welcome if kept on a lead. During summer months they must not be left in cars.